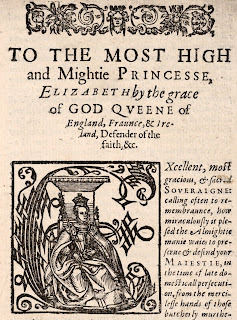 Today is the birthday of Queen Elizabeth I of England (she would be 485 years old), born a princess who never expected to become queen, and who was lucky even to survive the tumultuous politics of her childhood and adolescence. She undoubtedly enjoyed good luck throughout her life, but she was also intelligent, exceptionally well-educated, and shrewd enough to know the value of good publicity. 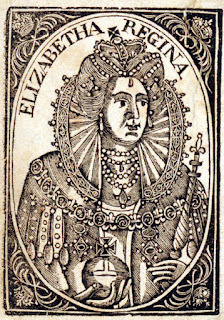 Those around her also knew the value of flattery, with the result that her long reign provided opportunities for her image to appear all over the place in the relatively cheap and easy form of wood block printing. 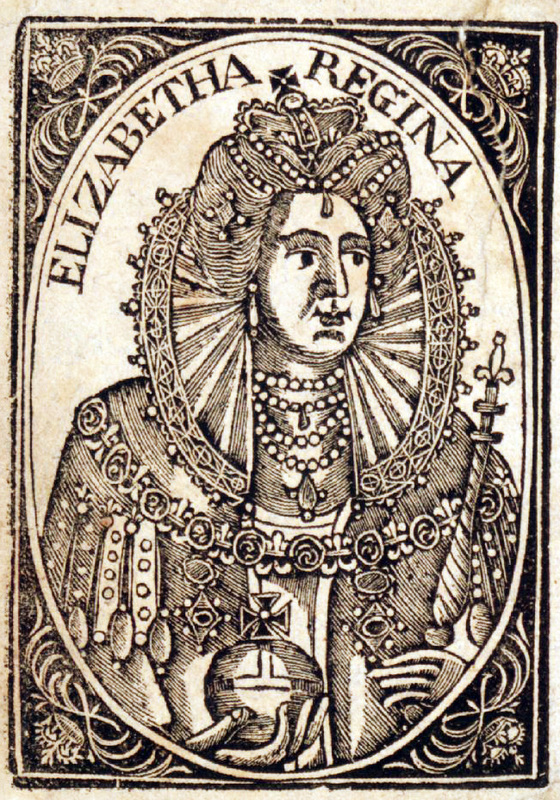 The first example is a later portrait after her death, which I find pleasingly bold, but the others are all from books published during Elizabeth’s reign. 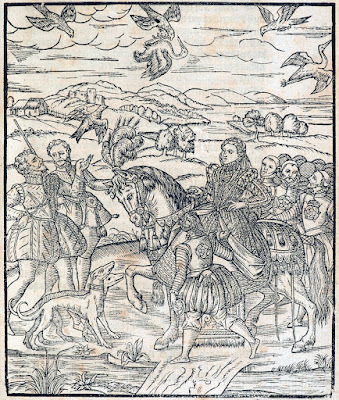 A guide to falconry features Elizabeth in its illustrations. 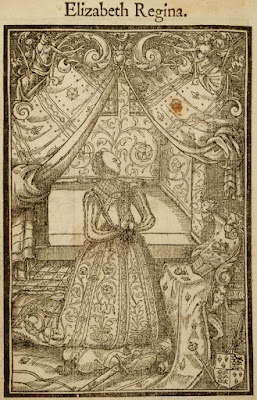 She is not named in the picture titles, but I think was intended to be recognizable to to all, not only with her features and dress, but her servants wearing the Tudor rose on their doublets. Presumably Elizabeth’s presence in the book would have added cachet, implying that the author’s methods of falconry were those followed by the very highest in the land. 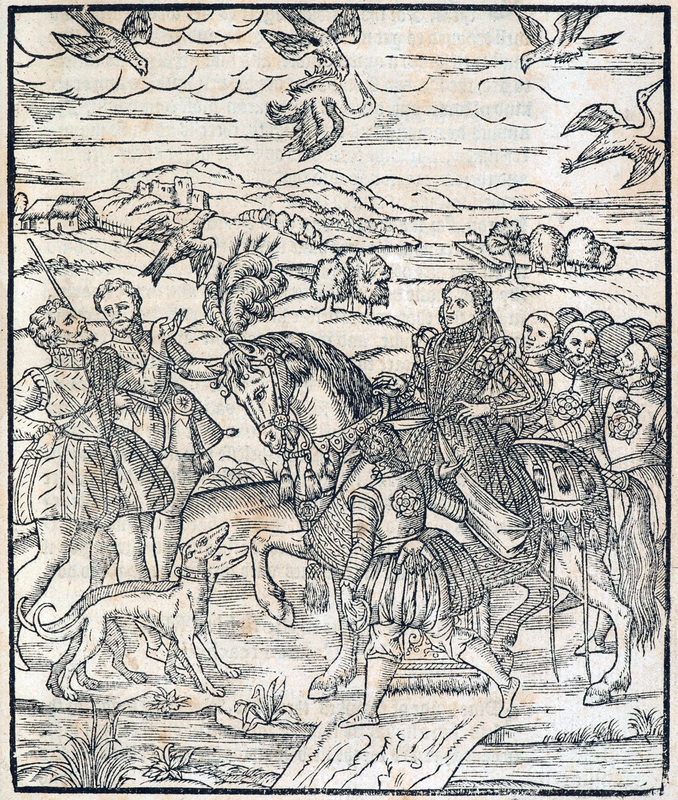 This is a very attractive woodcut, with the beautiful horse, lithe dogs, and a lovely landscape in the background. The author of The Compound of Alchymy was not so subtle. 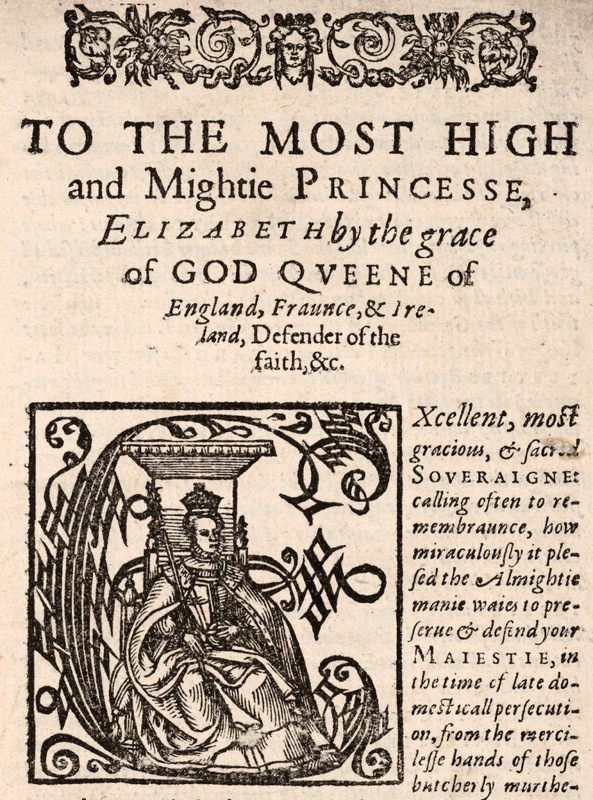 His dedication to Elizabeth, including this nice little portrait of her enthroned in the initial letter E, is fully fulsome. He lays it on thick… But despite claiming that his book contains “the right & perfect meanes to make the Philosophers Stone,” he clearly didn’t make any for Elizabeth, who died twelve years later. I do like the portrait, though, with nice detail in its very small space, and charming curlicues. not be “Head.”) Interesting details include the sword on the ground, along with another object I can’t make out. I’m sure there’s symbolism there, but I don’t know what it is. 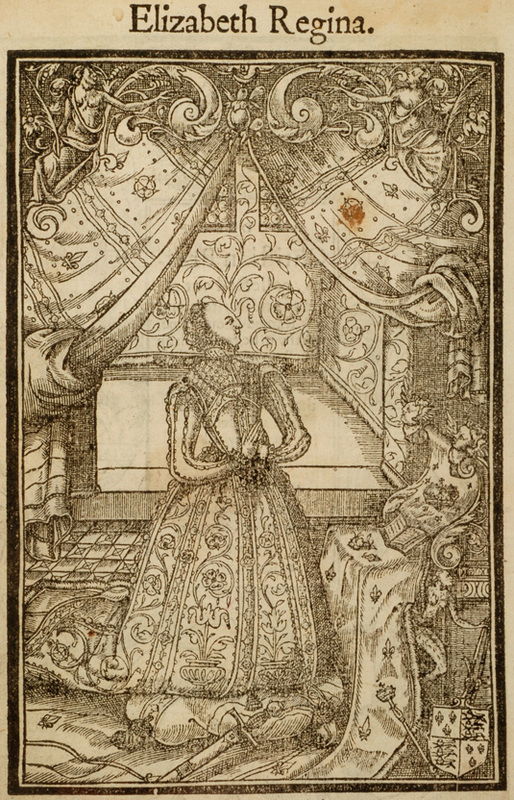 It’s a wonderfully detailed woodcut altogether, with shading almost as detailed as an engraving, and elaborate patterns decorating Elizabeth’s dress, the curtains, the back wall, and more. Elizabeth was not without her vanity, and I assume these portraits pleased her. They please me, anyway!